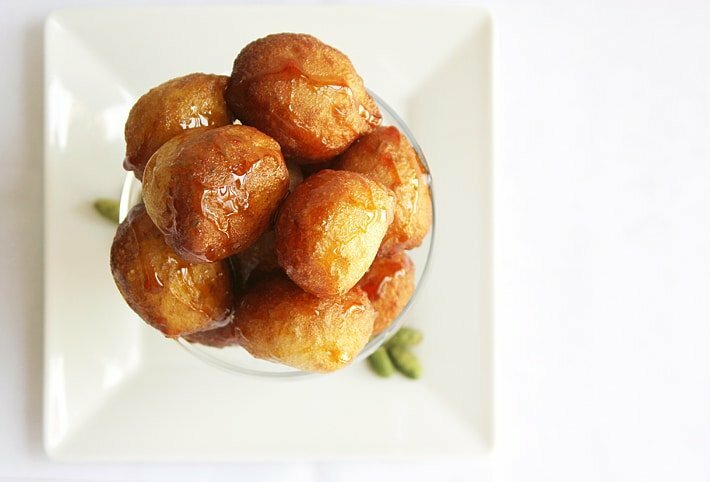 Crunchy Sweet Dumplings Luqaimat – Most Arabs enjoy Luqaimat in the Holy month of Ramadan, it is one of the popular desserts made in that month. If you could peak in any Arab Women’s kitchen during the month of Holy Ramadan, you’ll find a luqaimat batter resting on the kitchen table. I’ve posted a recipe of Sweet Dumplings before, but recently I’ve been getting e-mails asking me to make a lower calorie version. To be honest, this dessert can only be fried. I tried to think of ways to make it lighter but unfortunately, I could not. Instead, I made it easier to make and calculated the calories for you. Now you can make Luqaimat faster and be able to enjoy it in moderation. 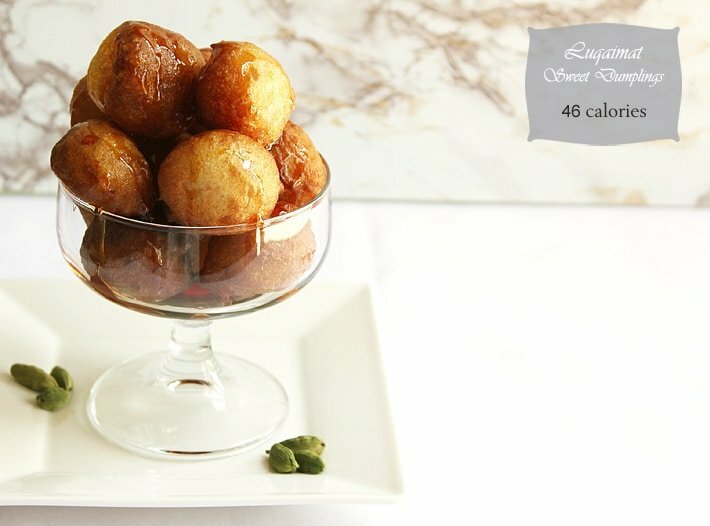 With 46 calories per a Luqaimat, you can have six luqaimat with date syrup, which equals to 276 calories. 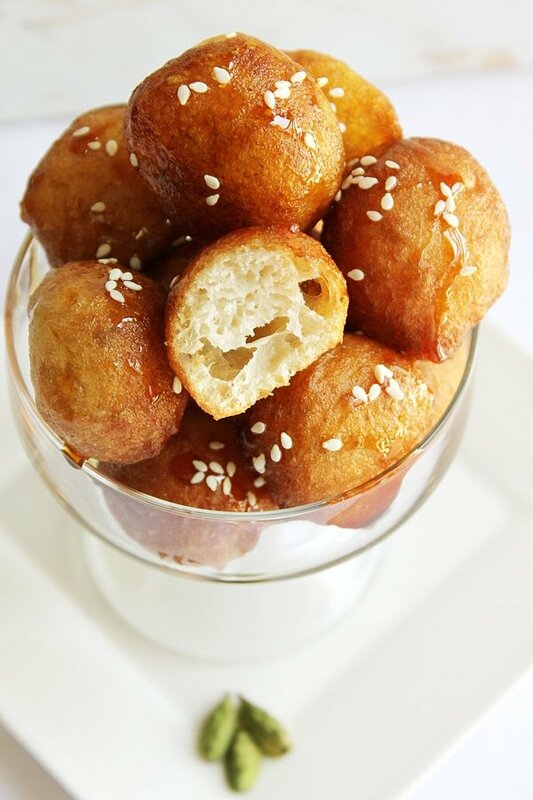 Between you and me, I know that six luqaimats will never be enough :D. No one I know can control himself and just have six, in fact when these sweet crunchy dumplings are served the thoughts of calories or anything else leave your mind. Two things left to know about these crunchy sweet dumplings luqaimat or sweet crunchy dumplings. Number one: You have to have these dumplings the same day, yes, it should be served fresh and by the next day or even after few hours, it loses the crunch. Number two: The smaller you make them the tastier they get. Do not make a mini dumpling but a 2-inch-high and 2-inch wide luqaimat are perfect. Usually, it served with date syrup but you can use honey or even maple syrup. There are many versions out there but this version is popular in the Gulf countries. If your dumplings didn’t turn out round shaped, don’t be discouraged, keep on trying and you’ll eventually have round ones. Good luck ? 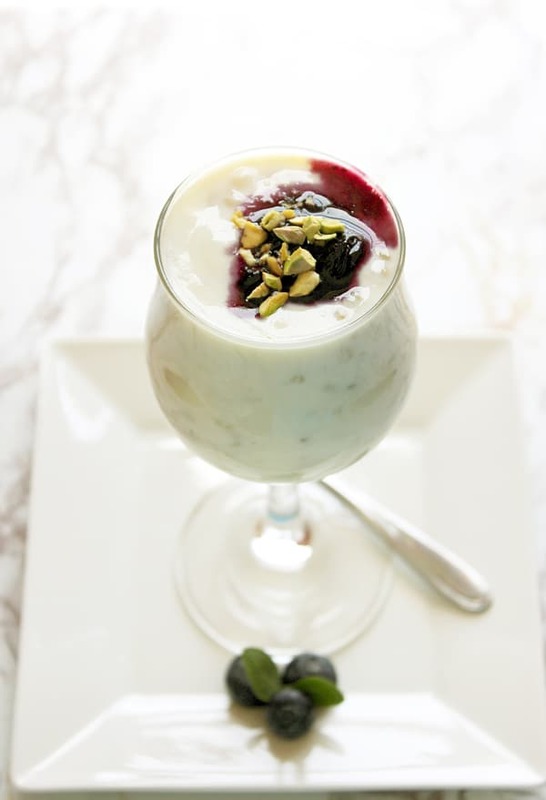 – In a blender, add water and then the rest of ingredients. Blend well until you get a combined smooth batter. – Pour in a bowl, cover, and let it double in size in warm place. May take an hour. – In a deep frying pan, add oil and when hot reduce to medium heat. – To test how hot the oil is, take a teaspoon from the batter, and carefully drop it in the oil, if it floats quickly, the oil is too hot. 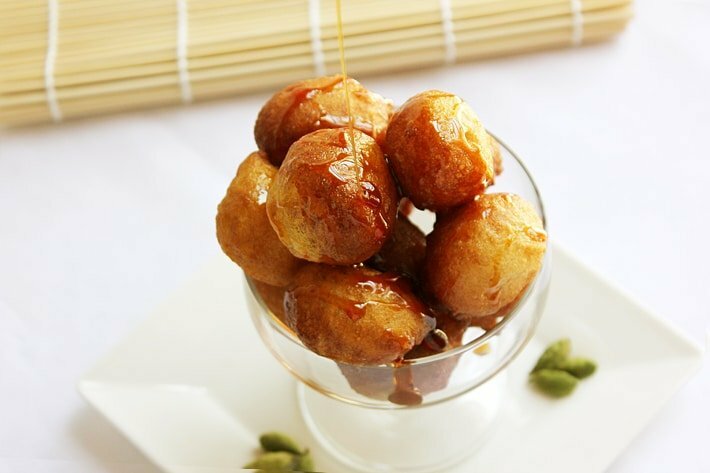 – Dip a spoon in separate oil, then take a heaped teaspoon from batter, push the batter off it using another spoon. Careful while dropping the batter in oil. – Move the dumplings around using a wooden spoon or spatula, this will make them cook evenly. – When the dumplings are light brown, remove from oil, and place them on kitchen paper. – Pour your favorite syrup on top (I’ve used date syrup). The syrup should be at room temperature. – You should serve these dumplings the same day you make them. I would finish the whole bunch at one go, Muna. They are irresistible! Muna, hello! I swear we have seen each other or interacted before on the blogosphere, but I can’t recall where so I’m here to say hi again after stumbling across your delectable photo on TS. I kid not when I say that the drool was slipping right out the corner of my mouth–these look so. Fantastic. 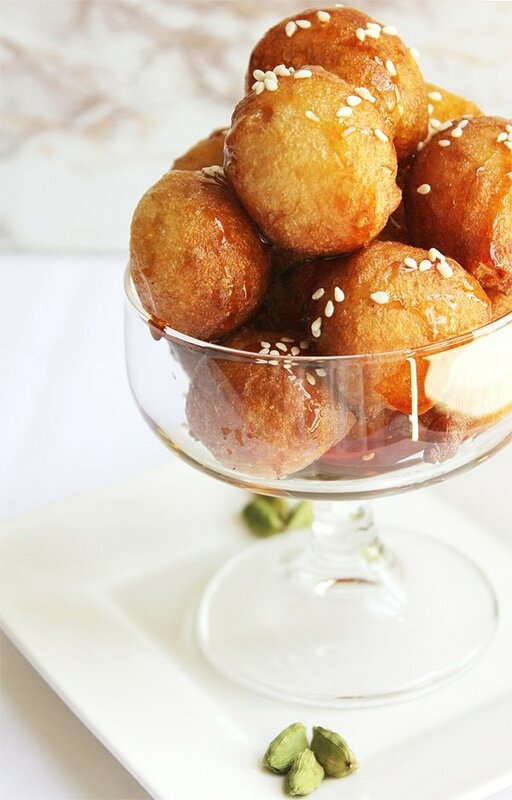 I am SUCH a fan of sweet fried bites, much more so than savory or salty ones! THANK you for sharing this, and it’s great to see you again, yay! Hi Ala, I think I have commented on your posts before! 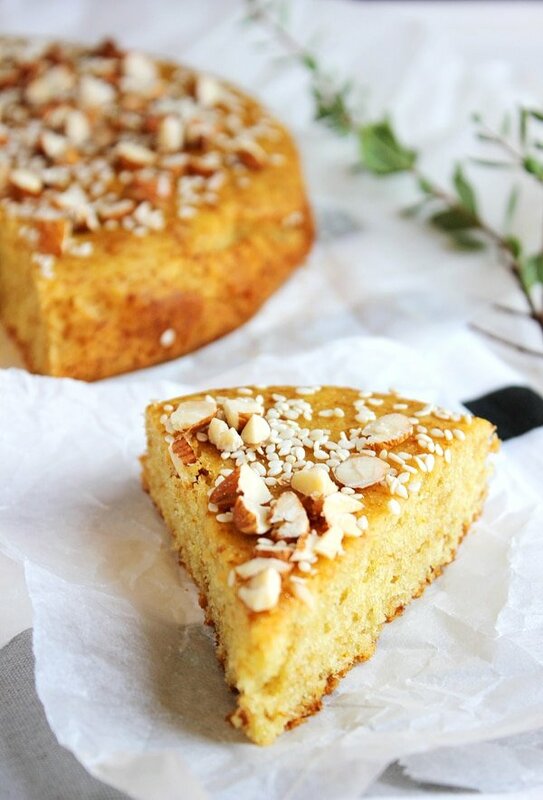 When I see good food I can’t help but leave a comment 🙂 … I’m glad you like my recipe, I hope you try it, I think you’ll love it. hey.. Oh i love luqaimat and we normally coat it with sugar syrup..
And theres where incredibly delicious..
would you like to experiment and share the recipe of that aswel too..
searched the internet and cant seem to find it..
Could I have your permission to use these images in a commercial work am doing right now? I always have an issue with lugaimat where by the time I cover them in date syrup and serve them they lose their outer crunch and just become squishy and too soft . What am I doing wrong ? Hi, After frying the luqaimat do not cover them, allow the luqaimat to cool completely and then pour the date syrup. If you pour the cold syrup on hot luqaimat the syrup will cover the luqaimat and will allow the heat in the luqaimat to convert into steam which creates a softer outer layer.